This recipe has been created for your Christmas table this year. I caution you - once you try it, it may appear often on your meal table, not just at Christmas time. We also enjoy using this paste (stuffing) to marinate and coat pork chops and as a stuffing for slow cooked lamb shoulder. 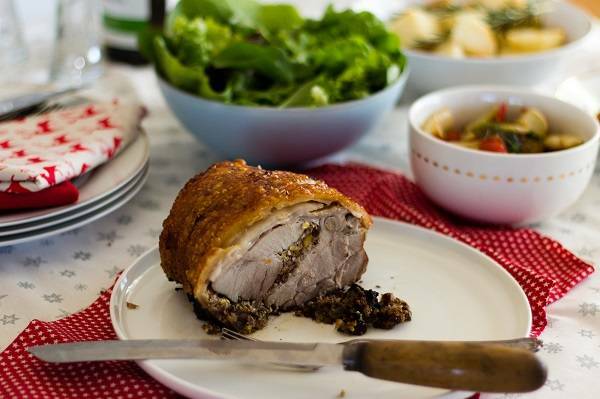 The flavours are rich and a little sweet, perfection on the Christmas lunch or dinner table. The Kambrook BlitzPro creates this stuffing very quickly, with minimal effort. Christmas can be a stressful period, especially if you are on cooking duty for the main family meal on the day. This recipe can be prepared in a few minutes and left to cook while you move on to prepare sides – or you could ask everyone to bring a side to share and you have an a easy stress-free gorgeous Christmas meal to share with those you love. I hope that you and your family love it and that you have a wonderful, safe and happy festive period. Blend the ingredients for 20 seconds, or until the desired consistency is reached. The paste does not need to be very smooth. It is nice to feel the texture of some of the nuts as you enjoy the meal. Unroll the pork by cutting any string holding it in shape and scoop the paste out of the cup, smoothing it over the center of the meat. When all of the paste has been added to the center of the meat, re-roll the pork using new string to secure it back into a roll. Create your own choice of side dishes to serve with this meal while the pork is in the oven cooking. Kyrstie helps and inspires families to grow their own vegetable garden and enjoy fresh healthy meals. She is the creator of the Kitchen Garden Box and her first book is due for release in March 2016.